Select Microsoft customers and partners can now use Azure cloud services and keep their data on native soil, Microsoft Canada announced on Monday. Azure, the public cloud infrastructure service that Microsoft operates, is currently generally available to 22 of Microsoft’s cloud regions around the world. Microsoft’s rollout plans include six new data centres – which it calls regions – totalling $15 billion USD invested. Canada will be included in that roll out. Canada should see general availability for Azure by the second quarter, Microsoft says. Shortly following that, Microsoft’s software as a service offerings running on Azure, such as Dynamics CRM Online and Office 365, will also be available from Canadian data centres. The move will see Microsoft fire up new data centres in Canada. Those were announced last year at an event with Toronto Mayor John Tory (pictured above with Kennedy), with Toronto and Quebec City being selected as the hosting locations. At the time, Microsoft said Azure would be running in the data centres by the end of 2015. “We’re making sure that the quality and service is right for our early adopters,” says Janet Kennedy, president of Microsoft Canada. It’s encouraging businesses to work through the 10,000 certified Microsoft partners to access the services. With a Canadian-hosted cloud, Microsoft and its partners can court certain customers that it wasn’t able to previously. The healthcare industry and financial industry for example must maintain compliance by keeping client data within Canada’s borders. Canadian customers interested in being hosted on the new Canadian data centres can get in touch with Microsoft or their service provider, she adds. TD Bank is one example of a Canadian Microsoft customer that’s migrating to the cloud. Last year, it moved 98,000 employee email inboxes from on-premises to Office 365. That’s typical of a majority of Canadian customers of Microsoft that are already using the cloud for some aspect of its business, Kennedy says. Asked to qualify that assertion, Kennedy points to Gartner’s rating of public cloud infrastructure services. Also, customers have the capability of running Azure’s stack on their private cloud and making use of the public cloud as well. 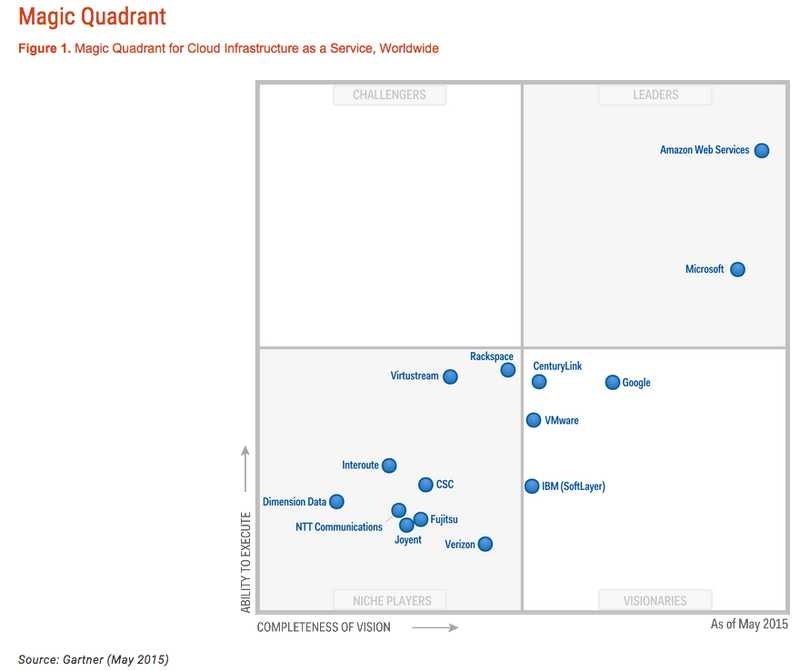 Gartner’s Magic Quadrant for Cloud Infrastructure as a Service, Worldwide report from May 2015 rates Microsoft alongside Amazon in the leaders space. It credits Microsoft’s strength in creating a cloud platform that feels holistic, while also rapidly rolling out new features and services. While in second place for market share behind Amazon, Azure is growing fast and has more than twice as much cloud compute capacity as the rest of the cloud vendors combined not including Amazon. Azure’s weaknesses are found in meeting promised time frames to introducing crucial features for enterprise needs, Gartner reports. Past outages of Azure’s service mean that some customers require running a non-Azure disaster recovery solution. Also, the partner eco-system is early in development and doesn’t have a lot of experience with Azure. For shops not already in bed with Microsoft, Azure might not hold the same appeal as a cloud option.